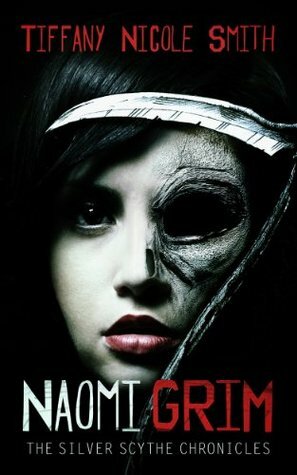 Welcome to my stop in the blog tour of Naomi Grim by Tiffany Nicole Smith. Today I'll share my review about this book, but make sure to stop by Itching for Books and check the full schedule. Collect lifestones from humans after they die. Rebellious, sixteen-year-old Naomi craves a normal life, but unfortunately, she’s a Grim by birth. That’s right, she sees dead people and hoards their living essence in a stone. Not a fun occupation. In order to be good at her job, she must live among human teenagers for weeks at a time. But Naomi soon becomes attached to the kids she’s been assigned to watch over. And knowing that these teens are gonna die under less than ideal circumstances, she has the opportunity to prevent their deaths from occurring. Only one big problem—interfering with death is the worst crime a Grim can commit. If she intervenes, she’ll put herself and her family in danger. Naomi must make the hardest choice of her career, go against the sacred covenant or watch her new friends walk blindly to their deaths. When I started reading this book was mainly because I was really thrilled with the cover, it looks gothic and dark, and I was craving for a book like this. I started it without reading the synopsis (yes, I’m that kind of reader). So, I really loved discovering the world of Naomi Grim. The Universe of Naomi Grim is really interesting; it’s like a parallel universe of… reapers? Where everybody know their roles, and all of them have to follow the rules, but hey, not everybody loves rules. The main character, Naomi Grim is a strong girl. I really liked her, she’s loyal and smart. I loved reading about her life, about the choices she had to make. The plot was well developed and I loved how the things grew as the story goes deeper. I’m used to read books about reapers (I still wonder if I can call them reapers), but this one was completely different from everything I read before. It was refreshing, and unique. I really enjoyed reading Naomi Grim, but there’s one thing I’d love was different. And that’s the descriptions of “Nowhere” the place where the Grim lives. I wish it was darker, most sinister and twisted. However, it doesn’t ruin the story; I still think it was new and refreshing. And I didn’t like the almost inexistent romance. And Naomi’s short name: Nay. Overall, Grim was a different story. A fast passed read. Sometimes it was funny, sometimes it was sad, I specially loved the ending, I think it was the strongest part of the story, I sure I’ll be reading the sequel as soon as I can.